It's Zoe's wedding day. She's about to marry Jamie, the love of her life. Then a phone call comes out of the blue, with the news that her mum Gina has been arrested. Zoe must make an impossible decision: should she leave her own wedding to help? Zoe hasn't seen Gina for years, blaming her for the secret that she's been running from ever since she was sixteen. Now, Gina is back in her life, but she's very different to the mum Zoe remembers. Slowly but surely, Gina is losing her memory. As she struggles to cope with Gina's illness, can Zoe face up to the terrible events of years ago and find her way back to the people she loves? Everyone who knows me, knows just how much I loved Katie's first novel, My Everything. Since I read My Everything last summer I have been eagerly awaiting A Life Without You. I was so excited when it came through the letterbox, that I dropped everything and started reading it straight away. I am pleased to say that it did not disappoint. My Everything had such a lasting effect on me that I didn't know how A Life Without You could ever live up to it, but it did all of that and more. A Life Without You tells the story of Zoe, a high powered business woman who hasn't spoken to her mother in over a decade. Zoe is shocked when she gets a phone call minutes before she is due to walk down the aisle. Gina's point of view and gives us a insight into what Gina's life was like throughout the years. If it wasn't for these letters being included in the book, I think that it would have taken a long time to like the character of Gina, but being able to see some things from her point of view made it easy to like Gina from the very beginning. I loved the character of Jamie, Zoe's fiance, enormously. Even though Zoe left him standing the alter and broke his heart, he stood by her when the going got tough and she needed him. Katie Marsh has touched my heart, not because she has focused on a horrible degenerative disease, but because she has shown that no matter what situation you find yourself in, there is joy and laughter to be had, if you can find it in your heart to let the badness out and some light in. 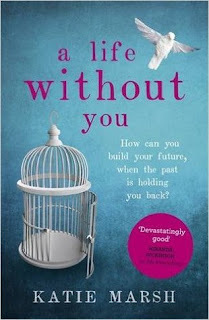 A Life Without You is a novel that will stay with me for a very long time. Yes, this book is about an illness, but it also about so much more. It is about the relationship between a mother and daughter, about putting the past behind you and forgiveness. Katie's second book shows just what a talented author she is. Not many books can make me laugh and cry in the space of a paragraph. This novel is not only filled with Katie's words, it is filled with her heart and soul and shows that blood sweat and tears went into writing such a beautiful and touching novel. Without going into too much detail and ruining the story line, I just want to applaud Katie for dealing with such a sensitive subject so beautifully. Because I loved this book so much I have decided to give a copy to one lucky winner. You can enter below. My favourite book of the year so far has to be Another Love by Amanda Prowse. I read it in January and still drinking about it. Just brilliant. That looks absolutely amazing. I just had a nice time reading through this post. I love reading books and have a huge collection. I think it would be good to host the book expo themed bash for my birthday at one of the rental event venues Chicago and would love to give the books as party favors. It will be a good idea to get some space for adding new books to my collection.